This entry was posted in Demographics, Economics, Finance, Globalisation and tagged ben bernanke, black swans, crony capitalism, japan, monetarism, rooseveltian resolve, shinzo abe, state capitalism. Bookmark the permalink. 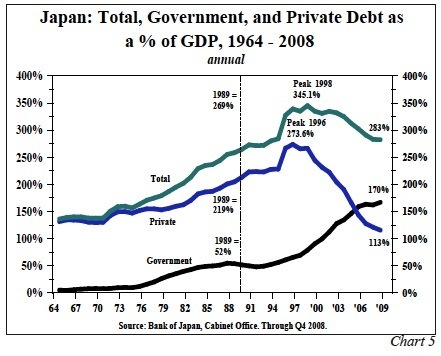 Japans public pension reform of 2004 requires inflation to be triggered. This is a wonderful example of how the system works. The Japanese are attempting to do the same thing they have been doing for the past two decades [only more so], and although this hasn’t worked out so great for the vast majority, it has been a windfall for the elite. So, the elite figure, why not do the same thing again, we’ll make billions… . As far as the bankers’ theory on what people will do in a deflationary environment, they are obviously full of s***. In a normal economic environment [which is deflationary, i.e., increasing productive within a sound money framework], people make reasonable economic decisions based on their own lives, not based on the value of the currency. Bankers are thieves, plain and simple. They will say/do anything to keep their ultimate something for nothing scam alive. It is not only individual retirees who have had a risk aversion… Japans private retirement fund managers have also been unwilling to take on risk after the 1990’s collapse. The Japanese as a culture were burnt to a crisp in the 80 to 90 market and property implosion, and their green tea leaf reading superstitious beliefs are all askew, so I don’t blame them to be risk averse to investing in the nikkei casino. At the end of the day you have a conservative mindshift that will take a long time to alter. Hard work, producing fantastic products, saving and enjoying real wealth accumulatiom through deflation is not a bad thing. Cheaper food, oil and imported goods imports, is not a bad thing, with a strong yen. The problem is less factory orders and higher unemployment of the young generation, due to the rise of a WTO China has gutted the factory production of the Japanese. Japans demographics are in their twilight years, so all that savings need to earn a return to keep up with the cost of living. My bet is on criminal elements in the economic policy setting, to take the wealth from the elderly. I do not trust the intentions of governments or policy advisors anymore, so my bets are Yakuza elements buying up Japanese equities, ripping wealth from the elderly. The Japanese are attempting to do the same thing they have been doing for the past two decades [only more so], and although this hasn’t worked out so great for the vast majority, it has been a windfall for the elite. Sadly, it is true that the elite benefits the most from this kind of program when it is done through the banking system. We do not yet have evidence about this kind of policy when everyone receives the output of QE equally. In a normal economic environment [which is deflationary, i.e., increasing productive within a sound money framework], people make reasonable economic decisions based on their own lives, not based on the value of the currency. 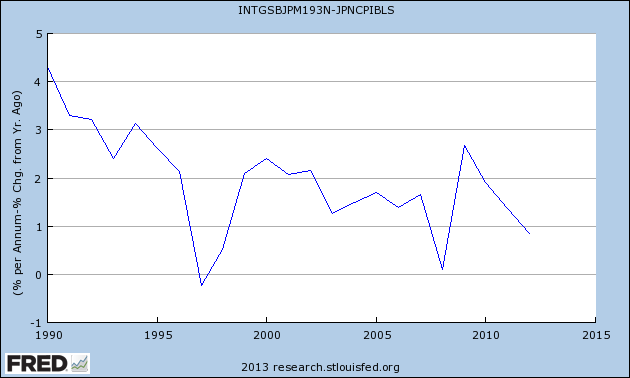 I question whether a “normal economic environment” is deflationary. Previous to the regimes of state-backed fiat money, money was a commodity. That is, if you could mine more of it out of the ground, then that was a form of quantitative easing. Sometimes, a massive deposit would be found, arbitrarily inflating the currency, especially when the gold had been pre-mined as the gold of South America was to the Europeans. Sometimes there was inflation, and sometimes there was deflation, and sometimes there was price stability and this was largely determined by the availability of commodities as much as it was the general level of economic activity. And in a way, when the gold standard is mandated by the state, it is just as much a fiat currency as anything else, because it makes tendering other monies (e.g. silver or credit-monies or now Bitcoin) illegal, stifling competition and really I think stifling competition is a problem under any system. I don’t see why the era of commodity money is any more “normal” than the era of pure fiat money. I’m not sure what the ideal monetary system is n but we have the system we have today, and that isn’t going to go away over night. I’ve lived my whole life under a fiat regime. So has anyone born after 1971, and even before then most people born after the 1930s lived in a de facto fiat system were the money supply and interest rates were determined by central bankers and not commodity miners. Fiat money and inflation are the new normal. That has effects. It makes debt easier, and the possibility of debt growth bigger and it incentivises spending now and disincentivises saving for later. Is that bad? Well, it’s good for some people and bad for some people. It’ been better for the elite with immediate access to capital than the wider population, and we see this implied in the income inequality figures. But there is a possibility (by changing the monetary transmission mechanism, and having the central bank uniformly helicopter the monetary base into existence, rather than give the money to the banks first and have them lend it into the economy) that this problem of inequality fuelled by the monetary system can be fixed. John, I believe you have to see money for what it is, and not necessarily for what it does. Although its use as an exchange medium is paramount in an economy such as the one we currently enjoy, this seems to over-shadow what money is, that is, the abstraction of labor-value. I believe it is this mis-reading that permits people to assume that [any] money can serve as a store of value, something quite illusory. Money simply equals x units of y labor at specific time. This value should vary with the value of labor over time and the not with the value of money. This is where those who control the money, essentially control the cost of labor, which is, of course, the source of all value. Creating money that does not correspond to labor preformed is not only counterfeiting, but completely distorts the value of labor. QE literally devalues your labor. THIS is what all people who own capital desire. This is why they have an inflation target of x %. The fact that QE increases asset prices is [really] not so wonderful for anybody in the long run [it raises the cost of maintaining labor]. It is decreasing the cost of labor that is most important in a system where you are taking as great a percentage of other people’s labor-value earned as is possible. I agree that the pre industrial revolution, money was equated with Labour Value. How do we reconcile the theory in today’s brave new world of robotics, machines and mass production, with very little hands on labour entering the total cost of the product? If the rich own the capital, labour is now a net drain, as people need to be fed, housed, and kept sated. Welfare costs will rise exponentially. Sometimes I wonder if the 100 year world war cycle is a natural part of the system. I had a very bad feeling yesterday, when an old man from Yugoslavia, who was a factory worker, said that the criminals in power are planning something to deal with this (this was in the context of the Korean crisis) He obviously had a gut feeling because he saw signs that frightened him. Do not forget the USA and South Korean annual war games prompted the threats from North Korea. All they have to do is amplify the war games to tip North Korea over the edge. Sounds like a Conductor controlling a symphony to me. Lets hope he does not instruct. The Dog whistler! As an Austrian economist (only loosely — I believe in taking ideas from everywhere) I believe in the Subjective Theory of Value. This means that value — and ultimately, moneyness — is in the eye of the beholder. Unfortunately this means I reject the Marxian labour theory of value. Labour value can certainly be one reason why people value things. But it’s not the only one. What?? The subjective theory of value? Value is ALWAYS in the eye of the beholder…it’s called THE MARKET, but when a market price is established, then, the value of labor is established [that is, the amount of labor involved that could produce such and such commodity at the market price]. What could possible have value if it does not involve human labor?…other than money or money-equivalents, or other items that are manipulated by banks, cartels, government, etc., etc. Just because somebody receives a certain amount of money for something does not mean that it has true economic value or it is being sold for its true price. Value exists in anything you or I are willing to pay for it. If value only stemmed from human labour, there would be no value in things like unimproved land. Now you are beginning to catch on, unimproved land has NO INHERENT VALUE. How can you “own” land? This is the same principle that applies in being a citizen and being “owned” by the state. How is this so? One of the biggest problems I can forsee will be when the generation whose savings plans have been or are being wiped out begin to retire – many of us have had our pension plans seriously devalued. Many of the SME`s and self employed have currently no viable way to save for retirement, if the Japanese model is followed and lasts for 20+ years what will become of current pension funds and savings plans? QE will devalue these faster than most can pump funds in. 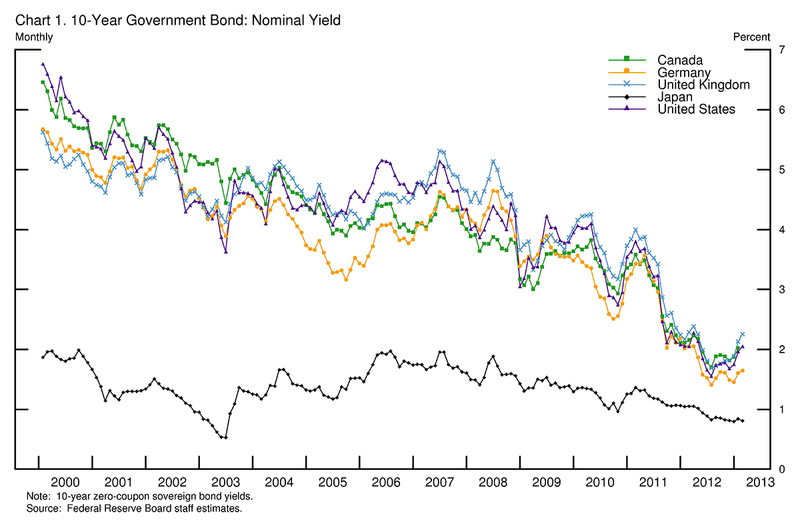 Will not even greater QE just accelerate this problem? If your retirment fund rules allow, invest in farmland, plant fruit trees, and build a home with recycled materials using non fossil fuel power, lighting and heating sources. Look after yourself in your twilight years. Real assets like this will be what is in real demand in the future. An apartment in the city, might be close to health care, but you will have huge living expenses. From my selfish point of view, since Australia’s stupid politicians gutted Australian Electronics Industry, with the loss of tariffs on Japanese goods, I will applaud the Abenomics move, as the yen aud cross has depreciated around 15 percent, so I get more flat screen for my hard earned aussie dollar. The Japanese worker is busily working to supply me with a TV and has to pay more for his Aussie beef stir fry. BTW, Economists need to get their heads out of their arse, and wake up to the fact that people do not wait to buy products and services because they expect prices to drop. With delation around negative 2 to 5 percent, which is massive, people are not going to go out and purchase a year into the future. In the REAL world, consumers buy when they need or have the impulse at the time. I did not buy a product yesterday, because my rational mind said buy now as it will go up 3 percent at the end of the year, and my income or investments are returning 0 percent. That type of thinking is insanity. Japan’s manufacturing has seen massive losses to China, and Abe needs to devalue the Yen, so people like me buy a Japanese TV and not an up and coming Chinese one. This is a race to debase, and if Australia’s reserve bank governor does not reduce interest rates, and the Government does not alter tax policy to see excessive investment in housing, then Australia will end up as a quarry, and not a high tech exporting economy. Its embarrassing to see these wankers at the RBA, deflate a housing bubble with monetary policy, when its is fiscal policy through generous taxation advantages to borrow money to invest in housing appreciation. Just watched a CNBC program with Soros. This guy us losing his mind, he suggested the Japanese will send capital overseas to USA to buy US treasuries. he forgets Australian Government Bonds are AAA and earning more than US treasuries. This explains the AUD YEN cross movement and Aussie Bond movement. Japanese are investing in Australia! Australia understands the value of mailing people cheques…? The surf board i bought with my QE money mailed to me is gathering dust. It would have been more prudent to build a high tech industrial park, farm irrigation system or water storage facility, or some type of nuclear reactor in the outback next to the yellow cake pit. Fear appears to be a great motivator when it comes to investing. Look at the hundreds of millions that flowed into Swiss paper at [literal] negative rates. Not that I know much about investing, but in times like these, I believe that conservation of capital is the name of the game. On this planet, if you are looking for the highest degree of safety [among institutional investments], where are you going to beat the U.S.? Fear and greed, two sides of the same coin. At least with Switzerland their low-interest rates are not backed by nuclear missiles. So true. Without fear, greed would not exist. It’s fairly amusing watching/reading people’s reactions to the coming disappearance of that which was but a chimera in the first place. Much of what exist out there [wealth] today is simply an illusion, money created out of thin air, somehow foisted upon the world and transformed into temporary wealth. So, now you watch the hoards grasping with all their might as to how one might hold on to this illusion, but alas, it is no more real than was the beautiful woman who was the star of your dream last [fill in the blank]. People need to give up the idea that wealth is anything more than your ability to live day to day, moment to moment, understanding that gaining, in and of itself, is an illusion. Lose your fear, and you have everything you need. Japan will be the first developed nation to fall; the Yen will be the first currency to collapse in the “currency wars”. Their debt stock is untenable and the market is starting to realize it. If they create even 1-2% inflation, there will be a massive selloff in JGBs and interest rates will start to move uncontrollably if their current policies continue. We’re witnessing a once in a lifetime event here; maybe this will tell all the Krugmans of the world to shut the hell up. Same thing happened in the 30’s. History rhymes alright. “The market” knows EXACTLY what’s going on and has ALWAYS known it. The difference between the market [which almost all institutional] and people like us [individuals] is that they could care less where the profits are coming from, that is, whether it is actually legit or whether its corporatism or Bernake printing money or whether the Man on the Moon has come down to Earth and is handing out hundred dollar bills. They could care less. Systems are born and systems die. This incarnation is near-death, being kept on life support by crooked bankers and governments. Just the same, the market will take it, and people will do all the things people do to rationalize their desperation in keeping their mouths affixed to the teat of something for nothing money.